This beautiful iron entry door is an install we have completed in Phoenix, AZ. This arched iron door has ornate iron work that compliments the architecture of this home leaving a cozy cottage like atmosphere, and has rejuvenated this home and given it a fresh new look with a simple door replacement. When arriving at your home, your entry door is the first thing not only your guests see but you as well. You door is your first impression to onlookers, neighbors and guests. 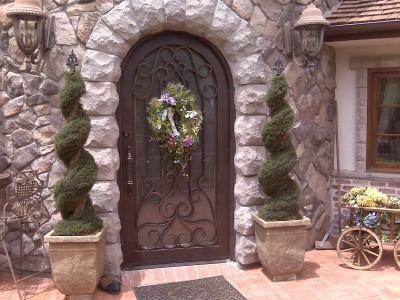 Let us create a dramatic first impression for you with a beautiful one of a kind custom iron entry door. Our Iron doors are but with quality materials and craft man ship, creating a seamless and elegant look while the door will last forever. Signature Iron Doors is proud of our product quality and customer service and we invite you to take a look at our website and contact us to see how we can help you with your iron needs.